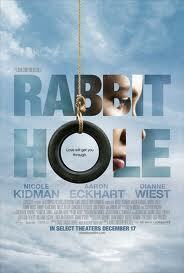 Rabbit Hole –sp David Lindsey–Abaire as screenwriter for this film, based on his own Pulitzer Prize winning play, really gets into the head and the emotions of two grieving parents 8 months after the death of their five year old son who died running after his beloved dog. We never meet Danny and barely see a picture of him but we come to clearly understand the relentless pain in all it’s forms which his parents Becca (Nicole Kidman) and Howie (Aaron Eckhart) are feeling. Each of them are grieving in his and her own way which despite sharing this most personal tragedy and a good previous relationship, there seems to be no room for empathy between them. Becca’s quest to find some way to deal with her deep dark feelings leads her to establish a relationship with Jason (Miles Teller), the 18 year old high school senior who swerved his car, which he confesses to her may have been going a mile or two over the speed limit, which led to the tragedy and now has created a bond between them. Becca’s somewhat religious mother (Diane Wiest) whose son died at age 31 , eleven years previously, provides a counterpoint from where she is coming. Nicole Kidman who saw the original play and started the ball rolling to make it into a movie chose John Cameron Mitchell to direct it. Mitchell and Lindsey Abaire who were guests at our screening acknowledged that they complemented each other as they explored the fine points of this film. The director, who had only a 4 million dollar budget, shared with us that he let the actors steep themselves into their emotional roles which he appeared to nimbly direct as well as spending a great deal of time in editing the fine points. He gave a touch of humor to a primarily a dark movie and kept us the audience observing at a slight distance from the unimaginable tragedy. We did not shed a tear for the young boy who we did not meet or really know. As mental health professionals who have worked with many grieving patients, we had the feeling that we were empathizing with people we cared about, as we might with a patient who is involved in their own dynamics that are unfolding before us at somewhat rapid pace. The fact that the writer, director and the actors really nailed the complicated feelings and interactions without ripping apart the guts of the audience (which they could have easily done) may be judged a shortcoming of the movie by some or the height of sophistication by others.